Truth be told, I’m not much of an art guy. Sure, I’ve spent an afternoon or two at the Art Institute of Chicago or the National Portrait Gallery, but those trips were mostly against my will. My idea of “culture” is a cold beer (or seven) and a hot dog (or three) at the ballpark. So if I’m going to appreciate art, why shouldn’t it be related to one of my core interests? Like cigars, for instance. I don’t know about you, but when I think about stogies, art generally does not come to mind. But with their decorative bands and aesthetically-pleasing boxes, maybe it should. Here are a couple examples of art that every Stogie Guy can appreciate. Brad Casanova of Casanova Cigar Carvings wrote us awhile back drawing our attention to his beautiful work. A master woodworker, Brad wanted his first personal carving to be both attractive and meaningful – so he chose to recreate the highly-detailed Fuente Opus X cigar label (seen below). Impressed? Yeah, we were too. 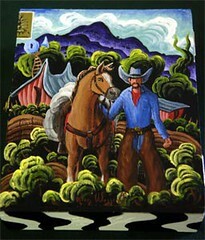 I encourage you to check out Brad’s “continuously growing collection of cigar art” at his blog. His work includes a CAO carving that was signed by Cano himself. If you’ve never had a reason to journey to the vast wasteland that is western Texas, here’s your chance. The Museum of the Southwest in Midland is holding an auction on May 8 that will feature 70 cigar boxes by “prominent” artists like Jesus Moroles, Glenna Goodacre, and Woody Gwyn (no, I’ve never heard of any of these people either). The picture to the right depicts one of the boxes that will be auctioned. The event – which celebrates the history of the cigar in the U.S. – will include a cocktail buffet and a cigar bar. Tickets are $75 apiece. Sadly, the chances of anyone from the Stogie Guys staff attending are slim to nil. Cigar Aficionado had a post back in January 07 about an artist, Noah, that has some gorgeous paintings of Opus X cigars. Wow I'm impressed those cigar band carvings are fantastic!